Economy Tree Service, LLC. is a safe, professional company, dedicated to you, our client, and your property. By maintaining a small staff, where the owner is an active part of the crew, we are able to provide clear and precise work, from the beginning estimate, all the way through the final cleanup. This ensures that all of the work meets the expectations and desires set forth by our clients. Our crew members are background checked, hard working, well trained and educated, they work efficiently as a team, to provide our clients with exceptional service. Our staff members are guided by an ISA Certified Arborist to insure your trees receive proper care and pruning techniques. We pride ourselves in always doing a complete cleanup after our work, to leave your property looking its best! Scott Swearinger, born in Davenport, IA. A Johnson Elementary Alumni, grew up in the construction industry with his father and uncles running the largest home framing company in the area. Scott graduated from Davenport West High School and went to work as a framing carpenter for his brother. Scott joined the Marine Corps in 1990, and first began working with trees when he returned from Somalia in 1993 and Camp Pendleton, California was hit by a major flood and the air strip had washed away into the forest. Scott’s unit was tapped to do the cleanup, and Scott was selected as the unit representative and was trained in tree removal. Scott was put in charge of the operation and his team completed the job early; he and his Marines received an award for their hard work. Scott continued his interest in trees as he served in the Marines; he worked with a local tree service as a ground man while stationed in South Carolina. In 1999 Scott decided to return home to the Quad Cities. Scott, after returning home, recognized that he needed to seek out a mentor and asked local tree legend Bill Plummer to formally train him in tree climbing. Learning from the very best in the area gave Scott the skills he needed to take charge of McKinley Tree Service for his in-laws, who purchased McKinley from a struggling self taught, tree cutter. 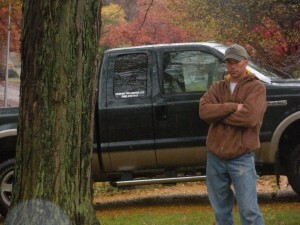 Scott quickly established himself as the go-to guy for storm damaged trees and difficult terrain. Scott’s experience in the Marine Corps as a Vehicle Recovery Specialist and his experience with the flood of 1993 at Camp Pendleton merged with the training he received from Arborist Bill Plummer to create an uncanny ability to understand the quickest, safest way to complete the most complex hazardous situations. Removal of large hazardous trees in the most extreme terrains became Scott’s forte, and Scott became known as the Quad Cities’ difficult terrain specialist. 2003, after his in-laws sold McKinley to a local business investor, Scott and his wife Dana were asked to go work at Gothic Landscape of Valencia, CA under Mike Gillette (San Diego Branch Manager) on a multi-million dollar landscape project in Eastlake, CA. While managing the Eastlake project, Scott was privileged to work with Reginald (Reggie) Rhea, a master horticulturist, master certified Arborist, and one of the nation’s top landscapers. Upon completion of the project Scott and his family returned to Bettendorf , After returning, and the now defunct McKinley Tree had been purchased and sold 3 times. In an effort to increase revenue, the new owner did not want to honor the Arborist Code of Ethic, so Scott decided it was time to go on his own and started Economy Tree Service in 2005, quickly re-establishing himself as one of the top tree services in the Quad Cities. Scott worked on large scale developmental projects for many local and regional developers. Scott worked with several city housing authority’s, security clearing for college campuses. Scott continued his pursuit of the most difficult removals, sometimes in hazardous conditions. In July 2007 Scott was asked to return to the Marines and was sent to Officers Candidate School (OCS) at Quantico, VA to train officer candidates. Scott received the Naval Achievement Medal for his work at OCS. While in Virginia, Scott worked as a climber for hire on the weekends and as a adviser for the grounds and tree maintenance on the base. Since returning to Bettendorf, Scott has been providing the Quad Cities with the very best in tree care. Scott has worked hard to expand his knowledge of Arboriculture and plans to take the Board Certified Master Arborist exam soon and will proudly join a short list of I.S.A. Board Certified Master Arborist’s. Scott will soon be attending Iowa State to pursue a Degree in Forestry. Scott holds several certifications from many different organizations. 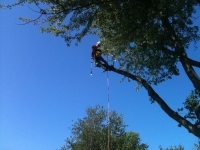 Scott is a Certified Arborist and a member of the International Society of Arborist, The National Arbor Day Foundation, The Tree Care Industry Association, The Bettendorf Trees Are Us Committee. Scott is currently working on bringing strict regulation to the industry in the QC area. Scott is a assistant Judo Coach for the Dynamo Judo Club at Miletich Fighting Systems in Bettendorf and volunteers for the Military Order of the Purple Hart. The cottonwood tree seed can stay in flight for several days due to the fluffy white hairs that surround the seed.